Before visiting Ipoh, I did my usual research on what are the Things To Do in Ipoh? And I read about the awesome Mural Art there. 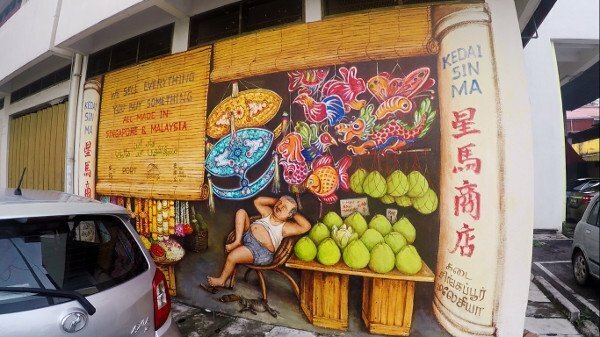 I had only heard about the famous Mural Art in Penang. And did not know they exist in Ipoh, too. Now, that I know, I made sure to track as many as I could. After we checked in Hotel Excelsior Ipoh, and unloaded our luggage there, we first headed for lunch. We were very hungry after a long drive. We went to Lou Wong Chicken Rice. It was very good! I will blog about this next. After lunch, it was time to find as many Mural Art as we could. It was perfect as we needed to walk and digest all that delicious food. Off we went to explore the city! Come along with us. 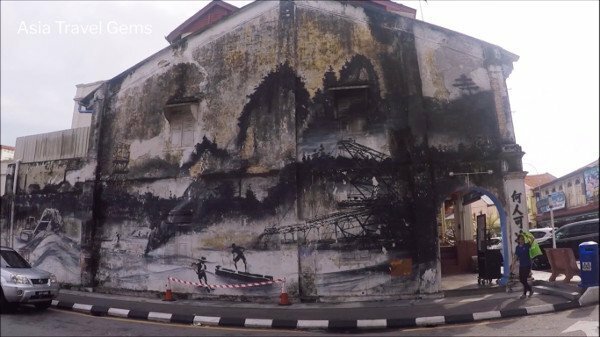 Prefer to watch a video of the Mural Art in Ipoh? Here it is! We did not have a planned route. To be honest, it was more like this – as mentioned earlier, we learned about the Mural Art in Ipoh. But we did not check where they were located exactly. So what we did was more of simply walking about the city, and spotted any Mural Art if we could. We were quite lucky. We found quite a few. Below was one of the well known ‘Art of Old Town’ mural set. 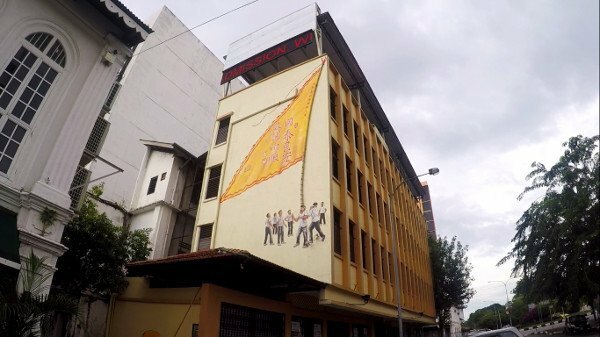 It was a collaboration between OldTown White Coffee and the City Council of Ipoh. The artist who painted this was Ernest Zacharevic. He was the same genius Lithuanian street artist that created all the awesome Mural Art in Georgetown of Penang. Kopi O is local for ‘black coffee’. There were 5 packets of the Kopi O, each emptier than the next. It was almost like a tribute to this iconic drink that was popular with the locals. We continued walking down the street, and my friend spotted this very colorful mural. It was about an old style provision store that sold fruits, lanterns, and other goods. There was a towkay – local term for boss – seated on a rattan chair looking all relaxed. The next mural we found was next to a local restaurant. They must have realized how these Mural Art drew crowds. So, they had one of three foreigners enjoying beer. How apt that the restaurant sold Carlsberg! Soon, we were less depending on chance, and more dependent on Google. We read about a place where there were many Mural Art. As we approached that location, we were amazed at a huge Mural Art painted at the side of that building. It was about a group of men practicing WuShu (martial arts), and one of the activities was to balance a very tall and large flag on their heads. You could not miss this! The location was supposed to have many Mural Art. But it looked closed, and all we could spot were a very few painted along the side of the facade. Quite sad. Even then, the paintings were beautiful. Here was one that could easily be missed if you did not really look carefully. 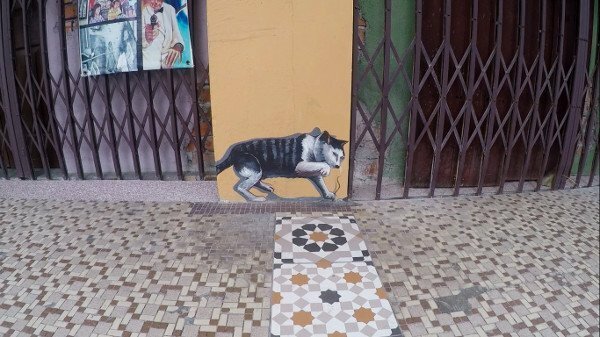 It was one of the smaller Mural Art of a cat catching mice. Was this art imitating life? Further along this perimeter, there are a couple more Mural Art. There was this charming coffee shop, complete with soft drinks that were no longer sold today, and a gentleman who could be the original barista, preparing coffee for customers. Next to the above painting was one of a trishaw rider. The trishaw was one of the old mode of transportation. It was made of a bicycle with a large seat in front of it. Passengers would sit on the large seat, and the rider would peddle the bicycle to take the customer wherever they would like to go. 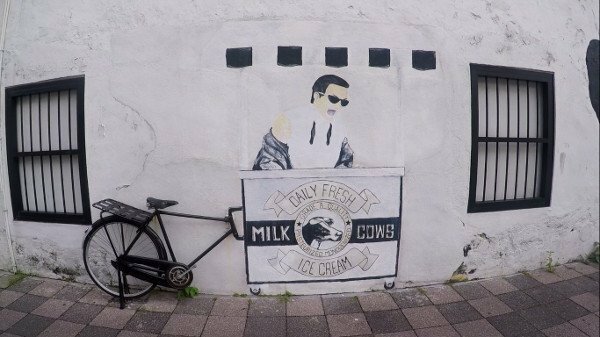 Here was another one of the popular Mural Art – an mobile ice cream seller. These mobile stalls would move from one location to another, and sold the most delicious ice cream served on a hot day. 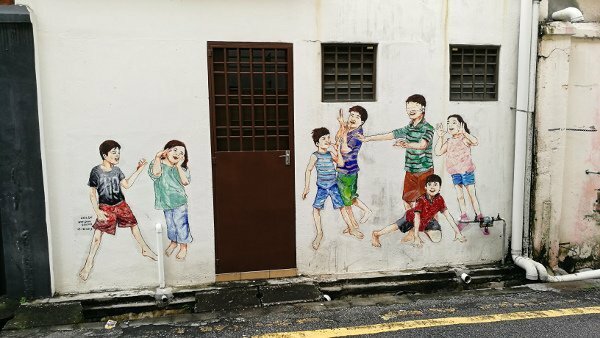 Another popular Mural Art that captured a group of children playing blind man’s buff, a very popular game in the old days. The artist truly delivered the energy and emotions of the children. The last one we have in this post was discovered by us, by chance. We were looking for one of the popular local attractions, one of the museums. But found instead this breathtaking Mural Art that was drawn all over the side of this building. This almost told a story, and perhaps it did. It was about the glorious days of tin mining in Ipoh. Back then, tin mining brought much prosperity and wealth to this small town. Today, tin mining has almost gone, with only a very few still in operations. 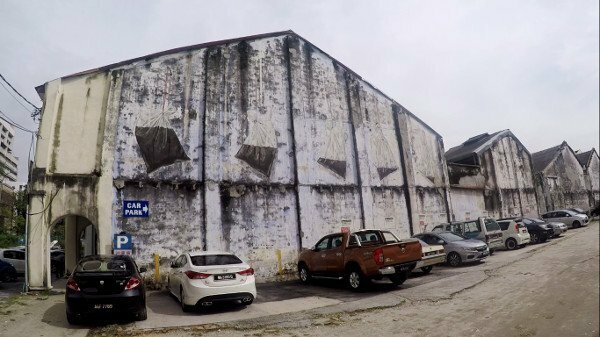 Where are all the Mural Art in Ipoh? The Google Map below shows some of the locations of the Mural Art in Ipoh. Perhaps you will have better chances of capturing more of the Mural Art? This was how we moved about within the small town of Ipoh. 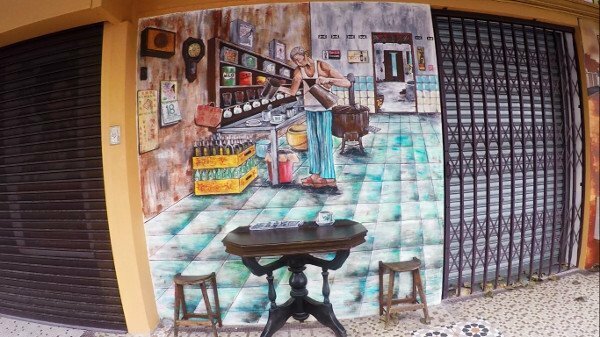 Just get a map from the hotel or use Google Maps, and you will be able to navigate easily to find all the Mural Art. This is a small town. There are no train services. There is no need actually. The town is so small that you can easily get about by foot (see above). There are local buses, but information on their routes and stops are not well provided. The town is so small, it is better to take taxi or Grab. Better still, since the Mural Art are all in town, simply go By Foot (see above). Tip: Public parking requires coupons. You can buy them from stores nearby parking areas. Tip: There are people hanging around public parking areas, and claiming to collect fees. It is up to you, but I would advise paying a small sum for the safety of your car. 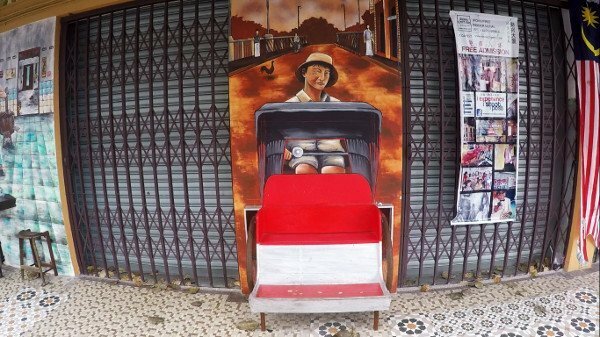 If you have ANY questions about this article, about Things To Do In Ipoh – Mural Art, ANY at all, please submit your questions as comments below. I will be happy to help you out. Wow! That’s pretty interesting. It is cool to see the creativity of the artists on the buildings. Thanks Melinda. Glad you like this article. I love all the murals and your pictures are wonderful! My nephew does a lot of traveling, I’ll send him a link to your site. Never heard of Grab before, is this basically like Uber here in the states? Thanks! Glad you love the murals & pics. I have many more nice pictures on my other blog posts. Please do visit them. Yes, Grab is like Uber. It is the strongest competitor. And many people, like me, prefer Grab. Please do subscribe to our Best Places To Visit In Asia newsletter to get updates. I love this!! I learned so much and I am truly fascinated by your discoveries. It makes me want to explore murals every where! The video is a nice addition to the pictures. Thank you for your generosity and peeking my curiosity. A wonder full experience here, thank you! You’re welcome, Kathleen. I am very happy that you love this. Please do visit my other blog posts to see more interesting places. Very nice and professional website. You seem to be a very experienced traveler. That can only help and I’m so glad you have decided to pass on that experience to us. That mural art is fabulous.. i had no idea. Thanks Paul. I am very happy to share my travel experience with the world. Glad you like the mural art. Yes, Grab is like Uber. It is the strongest competitor here in Asia. And many people, like me, prefer Grab. Great post! As a travel blogger, this makes me super excited! Hopefully I make it to Asia later this year! Your site will defn be book marked! Hope to work together in the future! Good to know a fellow travel blogger. 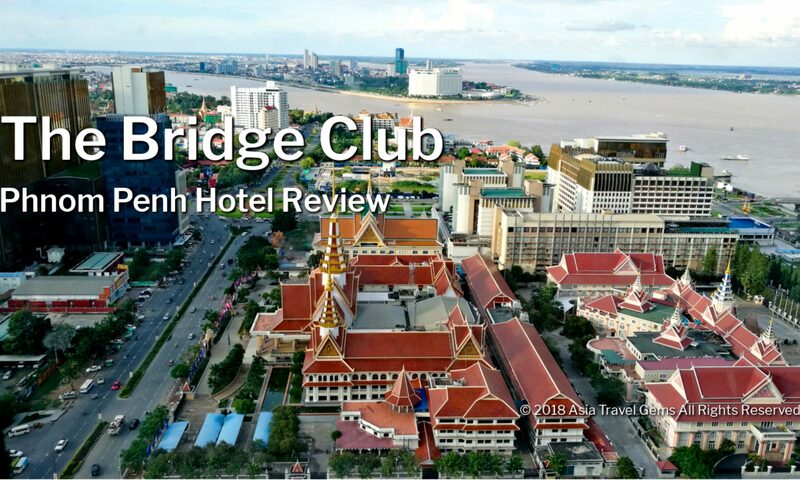 And thanks for bookmarking Asia Travel Gems. I enjoy street art and these murals are beautiful, unique and reflect a lot of personality in the area. There is a lot of creative talent in the area. I was wondering if there any art shows or museums, or galleries also in the area that features these artists and more? My entire family loves art and would make a great day of activities to do. Thanks! 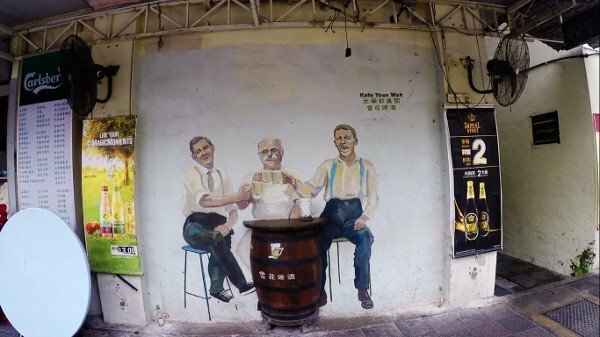 Glad you enjoyed the mural art in Ipoh, Malaysia. They are really awesome! Your whole family will love Ipoh!